It's officially summer! You know what that means in polishland, neons! Color Clubs got some great new additions to their Poptastic collection. This year there are six shade of neons, all in the shimmer family. Three of the shades have a warm golden shimmer while the other three have a cooler purple. Keep in mind that neons are notoriously difficult to photograph. I tried to get the swatches as close to accurate as possible but, they may be a bit off. Each bottle retails for $8. Kapow! 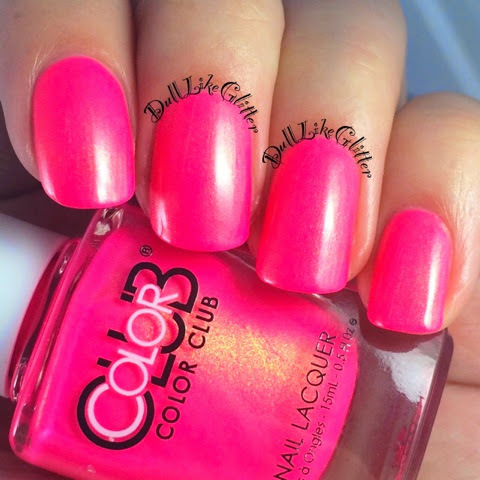 is a neon pink with a purple shimmer that cools the shade down a bit. Formula on this is great! It's a two coater. Where Kapow! is cooled down somewhat because of it's purple shimmer Peace, Love & Polish warms up with a bright golden shimmer. Another stellar formula and two coater! Foxy Mama is a hot orange full of golden shimmer. I will be wearing this ALL summer! Not-So-Yellow-Mellow is such a difficult shade to catch. 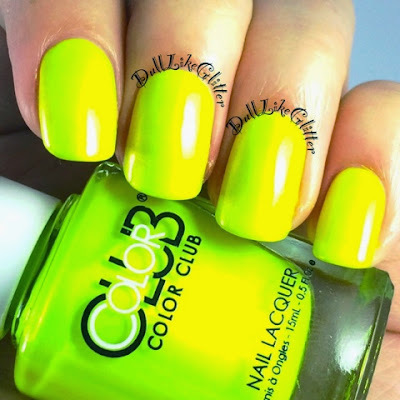 This is a classic highlighter yellow. There are some green shades here but that doesn't translate in real life at all. It's all yellow all the time! The yellow shimmer is a bit harder to pick up than it is in Foxy Mama but it's there. This shade was a bit thinner than the other formulas and took three coats for full coverage. Bell Bottom Babe applied very thinly with one coat and grew to opacity with three. The purple shimmer in this is heavy handed! Even though this one took three coats I really love this shade of blue! Right On is a neon purple with a deeper violet shimmer. This pretty purple was a two coater and I highly recommend! 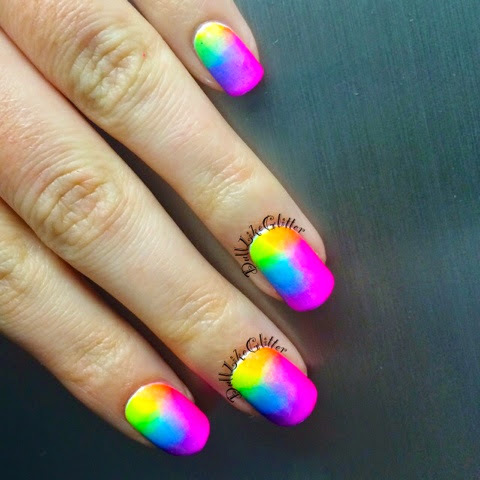 I wanted to show how amazingly these shades went together so I created a blended six shade gradient! My fingers are radioactively bright! I used a white base to make the neons pop but honestly, most of the shades didn't even need it. 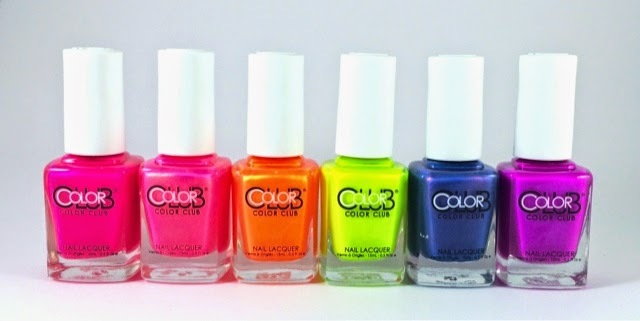 Which is your favorite neon from Color Clubs new Poptastic additions?